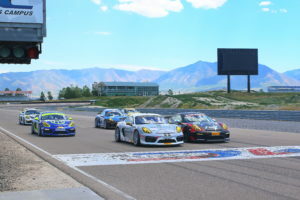 Tooele, Utah (4 June 2017) – Summer arrived with a vengeance in Utah on Sunday, as a rising desert heat looked to take its toll on man and machinery alike in Round 6 of the Pirelli GT3 Cup Trophy USA at Utah Motorsports Park. 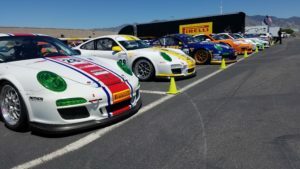 The combination of air temperatures in the 90’s, track temperatures of 107 degrees, and an altitude of 4,500 feet made for challenging conditions for the field of 27 Porsche Cup Car drivers. Diamond Class and overall pole sitter Loren Beggs led the field to the green flag and immediately separated himself from the pursuing pack, growing a healthy margin over the field. In what seemed to be a carbon copy of Saturday’s round 5, the train of three cars behind Beggs’ No. 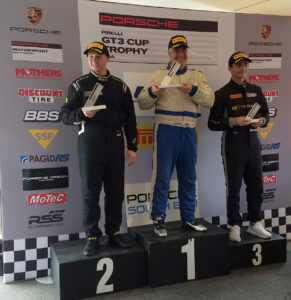 08 911 Design Porsche GT3 Cup machine kept in close contact, with WinWard Racing’s Russell Ward holding second ahead of Diamond Masters competitors Michael Zuiebeck and Bryce Ward. On lap 21 the full course caution flew, as safety crews were dispatched to Turn 1 to retrieve the stopped vehicle of Silver Class competitor Hunter McKenna, who was suffering from dehydration in the extreme heat. The race finished under the yellow flag, with Beggs taking the victory ahead of Russell Ward. Behind Ward stormed GT Technik’s 18-year-old driver Max Root, who had missed qualifying due to a mechanical issue suffered in Saturday’s race and had started last in the GT3 field. Root came up through the field in a stellar bit of driving that saw him finish fifth overall and third in Diamond Class. 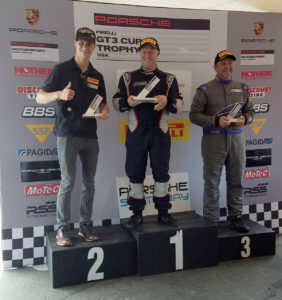 In the Diamond Masters Class, WinWard Racing’s Bryce Ward and Competition Motorsports Michael Zuiebeck once again battled throughout the race, with 911 Design’s Dave Elsner running third. Ward fought his way past Zuiebeck for third overall and the class lead on lap 7 and never looked back – though he did look forward, at the prospects of passing his son Russell. 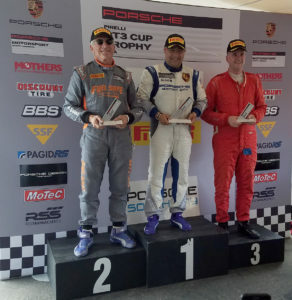 While the Platinum Class (for Porsche 911 997.2 versions) might appear to have a very familiar result – with TruSpeed Motorsports’ Ray Shahi taking his sixth straight victory – the on-track performance was anything but ordinary. Shahi qualified on the class pole but was moved back five grid positions due to a penalty for avoidable contact in Saturday’s race. A daring move into Turn 1 earned Shahi, driving the No. 65 Sterling Collision/Newport Porsche GT3 Cup Car, the victory ahead of teammate Larry Schnur and UMC veteran David Lockwood, driving for Air Power Racing. 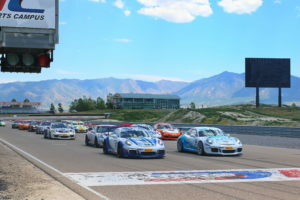 The Silver class for Porsche Cayman GT4 Cup Cars provided some entertaining action throughout the field, with the entire class staying in close proximity for much of the race. 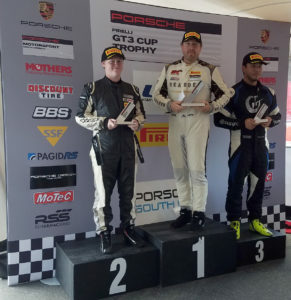 Sean McAlister earned the class pole for Competition Motorsports and took the green flag mere inches in front of Reardon Racing’s Jeff Kearl. GMG Racing’s Carter Yeung, starting in third position, took a look on the outside going into Turn 1, but wisely backed off as Kearl took McAlister’s rear wing and planted himself there for six laps. McAlister and Kearl split from the rest of the field, with Kearl stalking McAlister until he could make a move in Turn 5. McAlister then returned the favor, filling Kearl’s mirrors and hoping for a similar opportunity. He made a move in Turn 5 on lap 12 but couldn’t make it stick, spinning into the dirt in Turn 5 and effectively ending the battle – to Kearl’s mixed relief and disappointment. In Silver Masters class, Steve Goldman once again earned the victory in his No. 1 Competition Motorsports, ahead of teammate Mike Sullivan and Flying Lizard Martin Brauns. Goldman spent much of the race among the Silver class competitors, enjoying a spirited battled with Yeung and GMG Racing’s Hunter McKenna. Competent Motorsport President Greg Franz enjoyed the competitive nature and relative calm of Sunday’s race, pleased with the drivers’ performance following Saturday’s contentious battle. He noted the impression that both race director Randy Buck and series driver coach Craig Stanton left with the drivers earlier in the day that seemed to have an effect on the racetrack. 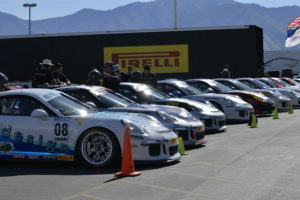 The Pirelli GT3 Cup Trophy USA heads to Mazda Raceway Laguna Seca next month for Round 4, July 28 – 30. 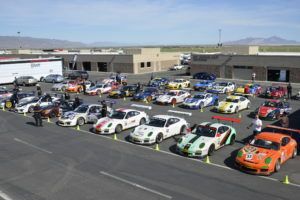 Follow all the news at http://www.competentmotorsport.com/. This entry was posted in News on June 4, 2017 by admin.